Following the discovery that Mac OS X Lion includes a new Reading List feature in Safari – similar to the popular Instapaper service – Instapaper’s creator went on record to say that the feature won’t be a competitor until it syncs with iOS devices. Well, it looks like Safari’s Reading List feature is going to be a competitor. Reader iBrokedk has discovered that Macs running the latest build of Lion will actually sync their Safari reading lists with iOS Safari. Our tipster claims that he was able to view his Reading List on his iPad via a MobileMe bookmark sync. Additionally, we have been able to confirm that Reading List sync is also an option through iOS’s standard iOS sync process. 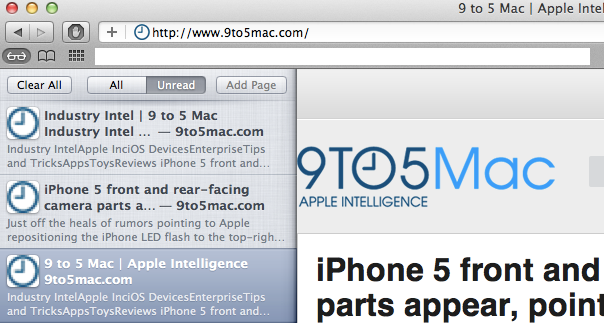 To access your Reading List on an iPhone, iPad, or iPod touch you need to head over to the bookmarks tab in Safari. Your Reading List should come up as a folder named, obviously a place holder, com.Apple.ReadingList.